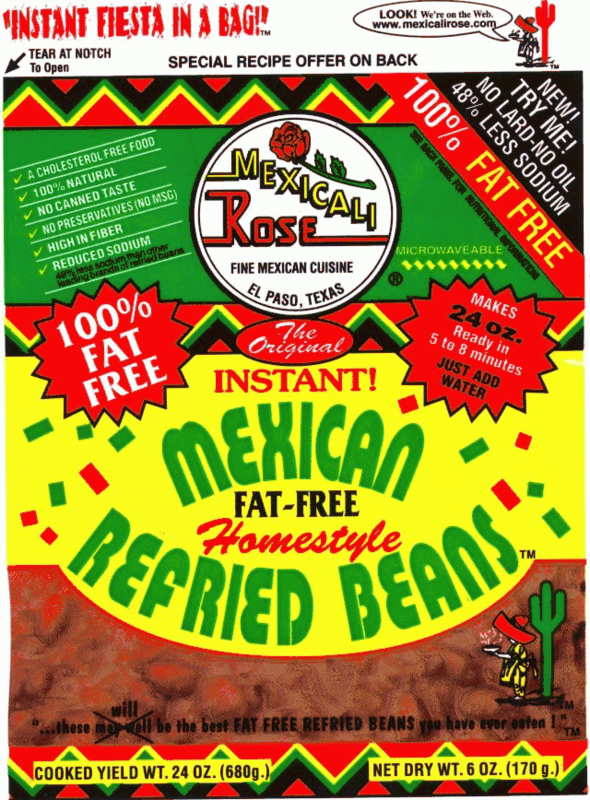 Mexican Refried Beans quick and easy -- just add water and you'll have wonderful homestyle refried beans to use on tostadas, tacos, burritos and as a side dish for all your Mexican plates. Mexican Home Style Refried Beans by Mexicaly Rose. The aroma and mouth watering taste of the Mexicali Rose Instant Refried Beans catch the Attention of every Homemaker and Gourmet Connoisseur. 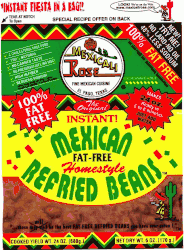 The bottom line is Mexicali Rose Instant Refried Beans are a phenomenally exciting, successful product. Convenient, consistent, time-saving, No Cholesterol, 100% Natural, No preservatives, high in protein, rich in Iron, No can taste, and most of all, homemade taste and quality unsurpassed. Los frijoles refritos instantaneos deshidratados de Mexicali Rose bajos en grasa, tienen la mejor calidad y sabor de hechos en casa. I loved them !!! Wish they were sold in a larger bag! These are so much better than canned. Tastes like really great restaurant beans. And you can make them in five min. I only put in 2 cups of water, no more, for perfect consistency. An excellent product. For a quick dish whenever you want or part of a fancy dish, these beans deliver good taste, convenience, and consistent quality. Usually I cook my own, but when I'm in a hurry all I have to do is add a few spices and I'm good to go. Gracias!